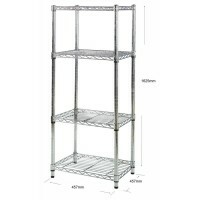 Those looking for a comprehensive storage solution will find that our 1625mm high chrome shelving is the perfect choice. The range of freestanding chrome wire shelving offered here at Chrome Shelving is comprehensive and all will suit the needs of commercial operators perfectly, as well as fit perfectly in a kitchen, garage or any other domestic setting. 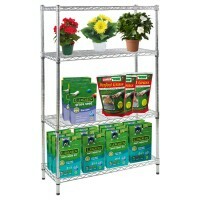 All of the chrome wire shelving offered on this site is designed to be assembled in minutes, and does not require any special tools or extra components. Quality and effectiveness is not affected by this though, as the robustness of the shelving still allows for up to 250kg to be stored per shelf. Uneven floors aren’t a problem either, as all shelves come with adjustable feet. 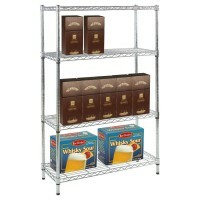 These shelves can be ordered for next day delivery and can also be combined with a number of other products, such as extra shelving and other storage options. 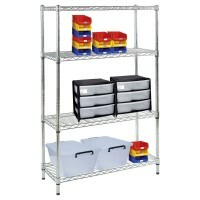 The shelves can also be joined to pre-existing storage shelves of the same kind, therefore creating a much larger storage solution.